Multi-tasking....how do teachers survive without it? Sometimes I barely feel like I am surviving WITH it! I'm pretty sure I have trained my brain to require over stimulation. I know that I am not the only one who has to make sure that everything they do is deeply meaningful and accomplishes multiple goals. Priorities when developing activities: flexible, assessable, and engaging. 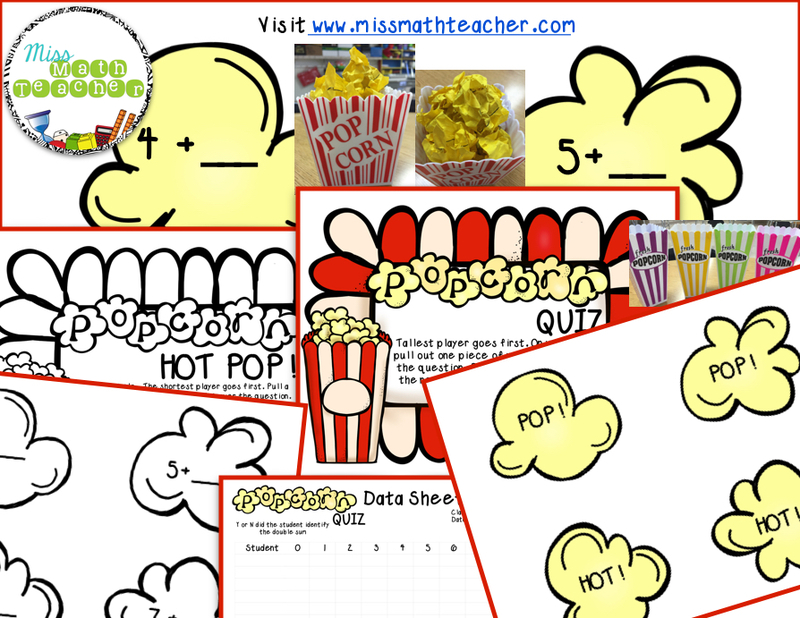 One of my go-to activities is Popcorn Quiz. It is crazy easy to manage and is flexible enough to use with several different grade levels and skills. I also love that it works if you have 5 minutes or 30. The combination of those qualities make it perfect for math rotations as skill practice and spiral review. This is how it all started. While working with my students on make 10 addition facts, I wanted a way to assess them. Now, I am not capable of giving something as simple as a worksheet that asks them to fill in the missing addends-too boring. I told them we were going to have a pop quiz. Enter Popcorn Quiz. I put all of the make 10 facts on paper kernels of popcorn, crumpled them up, and put them in a popcorn box. The kids went around the table answering the question on the popcorn kernel they pulled out of the box. Instant success! I didn't have to do anything, but sit back and collect data. My students began asking when we were going to have another popcorn quiz. Yes, you read that right, they asked for a quiz. So, I started making them for other skills and will continue making more. Target and Dollar Tree sometimes have plastic popcorn boxes that are super cute. Any box, bag, or bowl will work though. It's fun to print the kernels on white and yellow paper to really bring home the popcorn look. BTW- I do not waste time cutting out the kernels along the lines. #notimeforthat I just chop them in the paper cutter as rectangles and crumple them up. If you have an idea for a topic for a popcorn quiz, put it in the comments. Don't forget your email address. If I make one with that topic, I will send you a copy! 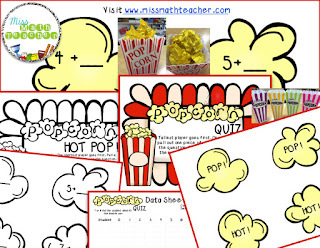 Get a copy free of the Make 10 Popcorn Quiz by clicking here.